The Chromebooks’ most alluring feature is its affordability. Software licenses to install Windows or Mac OS are major factors in a laptop’s price tag. However, Chromebooks come installed with Google’s Chrome OS, which is Linux-based and costs a mere fraction of the price. It is this inclusion of Chrome OS that makes a Chromebook, a Chromebook. Chrome OS is optimized to run the suite Google apps, such as Gmail, Google Docs, and Google Drive. Unfortunately, this means that the Chromebook provides limited or no support for non-Google software, such as Photoshop or Microsoft Office. While some people take to Chromebooks like a fish to water, this reliance on Google apps can feel quite limiting to others. As such, there is a growing community of Chromebook users who have taken to installing Linux-based distros on their Chromebooks. Many Chromebooks are perfect candidates for Linux. Their components usually have sufficient power and capacity and you don’t need to spend extra money purchasing an operating system’s software license that you won’t be using anyway. The #1 pick for best Chromebook for Linux is the ASUS C302CA-DHM4 . ASUS has also come up with a great convertible touchscreen Chromebook with their Chromebook C302. This 12.5 inch FHD Chromebook features a sleek aluminum body and a 360⁰ hinge so that the Chromebook can be used as a laptop, a tablet, a display or presentation screen. It is, as mentioned, a touchscreen Chromebook with multi-touch support and it comes with Corning’s Gorilla Glass for its screen surface for that extra bit of protection and scratch resistance. In terms of hardware specs, the ASUS Chromebook C302 has some of the best around for a Chromebook. The Chromebook C302CA runs on an Intel Core m3-6Y30 processor and 4 GB RAM. It also comes with up to 64 GB of storage – a rarity for Chromebooks. At optimal settings, this laptop can boot up in a speedy 3.5 seconds. It is as though ASUS purposely built this Chromebook for people who would be installing their own Linux distro. The downside of this ASUS Chromebook lies in its ports and slots. It only has a USB 3.1 (Type-C) port which can be quite inconvenient if you are still using devices with the USB Type-A port sizes that was the industry standard for a long time. In addition to that, it comes with a micro SD card slot, which can also be inconvenient as many people still use normal SD cards. Fortunately, micro SD cards are gaining in popularity nowadays and it is relatively easy to find an affordable one with decent storage capacity. The ASUS Chromebook C302 weighs a slight 2.65 pounds. It is also the thinnest Chromebook on our list (and one of the thinnest around) at just 0.5 inches in thickness. It is also reported to have up to 10 hours of battery life. Acer is one of the leaders when it comes to producing Chromebooks and their Chromebook 14 delivers. 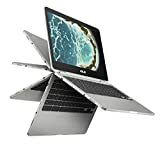 The 14 inch Chromebook has a display with Full High Definition (FHD) resolution of 1920 x 1080 pixels and In-Plane Switching (IPS) for wider viewing angles without color distortion. The Chromebook 14 has an aluminum chassis and comes in two colors: silver and gold. It houses a quad-core Intel Celeron N3160 processor and 4 GB memory. Acer’s Chromebook 14 comes with 32 GB flash memory. The Chromebook 14 does not have an SD card slot, however it does have two USB 3.0 ports and an HDMI port. There is also a headphone jack. The Chromebook comes with built-in speakers and a 720p HD webcam. The Acer Chromebook 14 is the heaviest one on our list, but still light, weighing in at 3.42 pounds. It is reportedly able to run for 12 hours between charges. Acer made it into our list for a second time with their Chromebook R13. This is a Chromebook that has been fitted with a 360⁰ hinge, allowing users to flip the Chromebook into several positions, such as the tent position for displays and presentations, the clamshell position for typing, or fully inverted for tablet mode. As one would expect with such a feature, the Chromebook is touchscreen with multi-touch support. Its screen is 13.3 inches with FHD resolution and IPS. The Chromebook R 13 has a quad-core 2.1 GHz MediaTek MT8173C Core Pilot ARM processor and 4GB RAM. It also has an integrated Imagination PowerVR GX6250 graphics card and 32 GB flash storage. What we like about the Acer Chromebook R13 is that it has been outfitted with not only a USB 3.0 port but also with a USB 3.1 (Type-C) port. This makes it a great Chromebook for those who have peripherals that use either types of cable. It also has an HDMI port and a headset jack. It weighs in at 3.28 pounds and, similar to the Acer Chromebook 14, is said to have a battery life of up to 12 hours. Samsung’s latest Chromebook 3 has been well received by users, and for good reason. The Chromebook 3 has a Intel Celeron N3050 processor, which is paired with a solid 4GB of RAM. A 16GB SSD drive ensures you’ll have speedy boot times. An 11.6″ HD Anti-reflective display is handy if you ever work in sunlight, and the 11.6″ screen keeps the weight down, with the Samsung weighing only 2.54 lbs and being 0.7 inches thick. One impressive feature of chromebooks is their battery life and the Samsung doesn’t disappoint, sporting an 11 hour battery life on a single charge. Some other great features include a spill-resistant keyboard, perfect if you plan to give the chromebook to your kids to use. A HDMI input allows you to hook up the TV and it also comes with a webcam and headphone jack. You can’t go wrong with the Samsung Chromebook 3 as a budget chromebook choice. Samsung was one of the first manufacturers to come out with a line of Chromebooks and remains one of the leaders in Chromebook production. Their Chromebook Plus is Samsung’s Chromebook with 360⁰ hinge that is fitted with Gorilla Glass 3 and has full touchscreen capabilities with multi-touch support. Setting itself apart, the Chromebook Plus also comes with its own stylus pen, making it a great option for students or professionals who take constant notes or artists looking for a sturdy Chromebook. Said artists would also appreciate its display with Quad HD (QHD) resolution of 2400 x 1600 pixels at 400 nits brightness. Samsung’s Chromebook Plus comes with a hexa-core OP1 ARM processor, 4 GB RAM, and 32 GB eMMC hard drive. The Chromebook Plus might be ahead of its time with two USB Type-C ports. It weighs 2.38 pounds and is reported to have up to 9 hours of battery life. The most important consideration when purchasing a Chromebook with the intention of installing a Linux-based system is to ensure that the Chromebook’s hardware is compatible with the Linux software that will be installed. This is an extremely important step that everyone must take before committing to purchasing a Chromebook for Linux. Linux is well-known for compatibility issues and people who don’t do proper compatibility checks often meet with a lot of frustration. Basically, this means that you should know exactly which new operating system you will be installing and what programs are must-haves before you buy your new Chromebook. For our list of considerations, we cast wide net that encompasses compatibility with as many Linux distros. However, it was impossible to pinpoint one-Chromebook-for-all as there are so many Linux distros available, such as GalliumOS or Mint. We determined this final list by researching feedback from users who have made the switch with success and no compatibility issues. Most Chromebooks produced by major brands will have sufficient power requirements when it comes to their processor and memory. In order to help keep costs down, Chromebooks are usually fitted with cheaper processors, such as Intel Celeron or ARM processors. The processor compatibility check is particularly important. For example, some ARM-based processor chips might give compatibility problems to those hoping to install Ubuntu. Currently, the standard hard drive capacity of Chromebooks seems to be a 16 GB flash storage drive. This amount is relatively small compared to laptops that come with solid state hard drives that reach up to 512 GB. While 16 GB is certainly sufficient to install a Linux-based operating system, we also tried to look for good 32 GB Chromebooks as well. Another great feature for a Chromebook is the addition of an SD card slot. This allows users to insert an SD card for additional storage capacity. One of the best features of a Chromebook is their great battery life. A good Chromebook should be able to run for at least 6 hours on battery. Ideally, 9 to 12 hours would be better, so we narrowed our search to Chromebooks within this range of battery life. As they are so reliant on Google apps, a Chromebook almost always comes with wireless internet and Bluetooth capabilities. In addition to that, however, we are also looking at Chromebooks that provide other accessories, such as a webcam and speakers. Our final consideration when it came to choosing a Chromebook was the weight factor. People who are interested in Chromebooks are generally looking for a device that is lightweight in both price and bulk. As such, we filtered our list to Chromebooks that weighed between 2.5 pounds and 3.5 pounds. Chromebooks are great laptops for Linux. They are inexpensive, which makes them a perfect choice for those who are looking to experiment with their first Linux-based operating system before jumping into a more powerful Linux laptop. Advanced Linux users also find them extremely useful as secondary or more portable devices. As you can see from our list, all the Chromebooks differ from each other from aspects as crucial as their processing chip to other features, such as which ports and SD card slots are available. The Samsung Chromebook Plus is perfect for those interested in a device with a stylus and great resolution. It is also a great choice for those who have begun to collect accessories that require USB Type-C ports. Toshiba’s Chromebook 2 is one of the most popular choices out there, and it is partly because it has great compatibility with many Linux distros. It is also built with all the accessories you need for video chatting. The Acer Chromebook R13 comes with a variety of ports and has fantastic battery life. It is also convertible between laptop and tablet. Anyone looking for mobility would be well-served by the Chromebook R13. With its 14 inch screen, Acer’s Chromebook 14 is a good pick for someone looking for a larger screen. It is also a good pick for those looking for a different color, as you might have noticed that most Chromebooks tend to come in either silver or black. The ASUS Chromebook C302 remains our favorite thanks to its Intel Core M processor, tablet-laptop convertibility, and its fantastic storage capacity.